California isn’t the only US state with massive displays of annual wildflowers following rainy winters! Neighbouring Arizona is also well worth a visit–and perhaps less crowded. Only a few hundred meters (yards) from where these photos were taken, peridot was being actively mined (though at a small-scale). This part of the San Carlos Apache Reservation is the only current site for peridot extraction in Arizona. 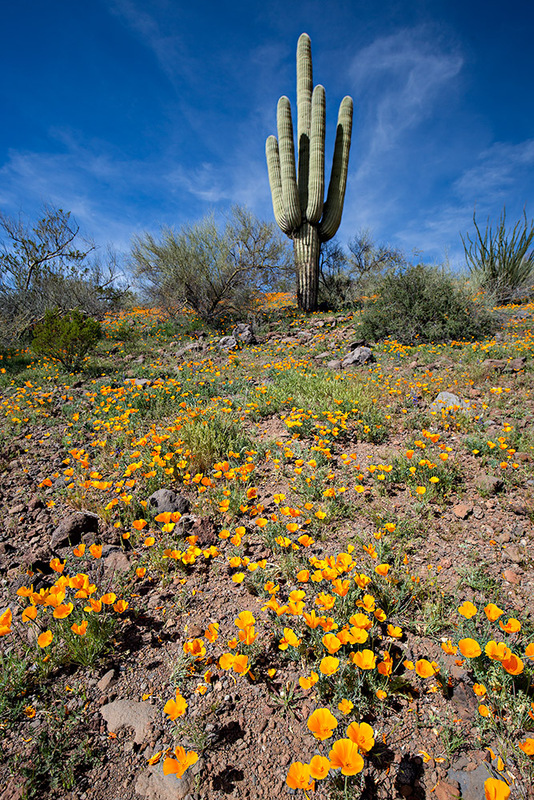 As much as I appreciate gemstones, the Mexican gold poppies and saguaro cacti were the reason for our visit. The current population trend for Carnegiea gigantea is downward (according to the IUCN Red List) though the species remains of Least Concern unlike many of its cactus brethren. In the USA, the number one threat is increasing urbanization, and this was obvious to us as we traveled in the Phoenix-Tucson corridor. In Mexico, the threat is land use change due to cattle-ranching. An introduced invasive, Cenchrus ciliaris or buffelgrass, is also problematic as both a competitor for water and its susceptibility to starting rapidly-burning fires (as perhaps happened to “The Grand One”, the champion saguaro cactus linked to above). Eschscholzia californica subsp. mexicana, as you might imagine, isn’t threatened in any way. It is sometimes considered its own species of poppy (see notes in Jepson eFlora), and you can sometimes find references to it as Eschscholzia mexicana. At the least, it differs from the Eschscholzia californica in always having an annual life-cycle and seed leaves (cotyledons) that are entire. As is the case for many annuals, seeds may remain dormant in the soil for many years until sufficient rains prompt a mass bloom. A couple of side notes: 1) For those following me on Instagram, the first photo will look similar to one I posted while on vacation, but I thought I’d post a digital SLR version of it in accompaniment to the second photo today; and 2) It was pointed out to me that some of the entries posted while I was away (and almost all older postings) had commenting disabled. I think that was an attempt at dealing with the commenting issue on the old system (remember how it took five minutes to post a comment sometimes?). I’ve re-enabled commenting for all entries, old and new. Two beautiful photographs ! Thanks, Daniel. I grew up in Tucson where there are two Saguaro National Monuments (East and West). 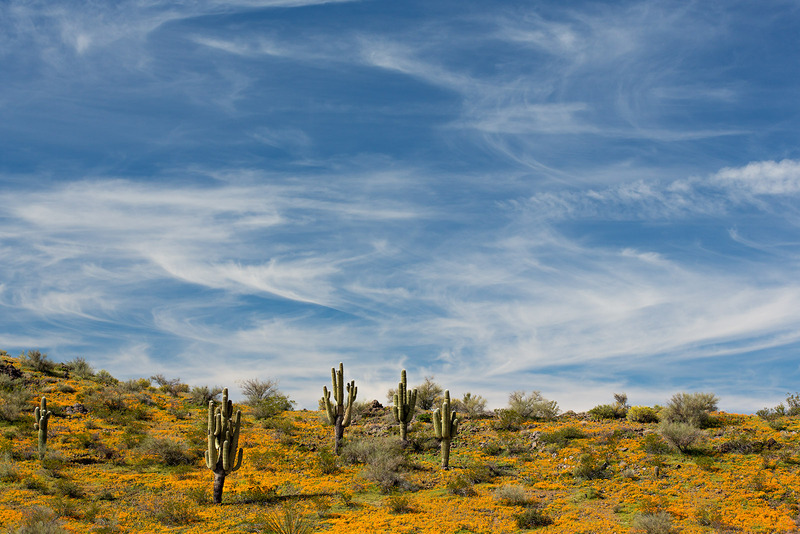 The desert in the area can be spectacular for wildflowers in the Spring, especially if the rains hit just right in the Winter. About half way.between Tucson and Phoenix along the west side of Interstate 10 is Picacho Peak State Park, the location of the farthest west Civil War battle. It was used as a guide post for travel in the 1800’s as from some angles it looks like a saddle and is distinct from all angles. About every 15-20 years the rains come at just the right intervals to water the poppies and produce an explosion of them. Other years are also worth the visit. The valley floor is covered in yellow which spreads up the entire North side of Picacho Peak. It looks like the area has been blanketed in yellow snow (the good kind 🙂 ). When that happens the park hosts 100,000 autos per month just to see the flowers. My wife and I were married there as we had frequently hiked and camped there whille dating. I recommend a picture search for flowers at Picacho Peak. Oh my ! What stunning photos ! Thank you, Daniel, and UBC. Beautiful photos! The clouds in the second picture are so lovely.